Until recent years, few U.S. citizens have been able to experience Cuba travel. But under a licensed granted by the U.S. Treasury Department’s Office of Foreign Assets Control, Tauck has been providing People-to-People educational exchange Cuba tours since 2012. Meet face-to-face with local residents from different professions, share thoughts, gain knowledge, and connect with Cuba’s cultural heritage on our 7-day, Havana-based Cuba: Connecting with People and Culture. Around key themes of Cuban culture and the arts, history, architecture, entrepreneurism, agriculture, baseball and more, travellers interact directly with the people of Cuba. Meet Cuban students, teachers, architects, artisans, dancers, musicians, coaches and ballplayers… learn about Ernest Hemingway’s Cuba… discuss art and private enterprise at the studios of community artists… visit with agricultural workers to talk about agrarian reform and organic farming… interact with members of community and charitable organizations about their work… learn about Cuban cultural traditions… have meals at paladares (small, privately operated Cuban restaurants)… and connect with Cuba on Tauck’s cultural exchange. Tauck’s Cuba travel experience begins at 4:30 PM at The Ritz-Carlton Coconut Grove, Miami. Guests flying to Miami should plan to arrive at Miami International Airport by 2:00 PM, and take a taxi from the airport to The Ritz-Carlton Coconut Grove, Miami (for a flat fee of USD $35 plus tip, for which you will be reimbursed by your Tauck Director). Guests who are arriving by car may park at The Ritz-Carlton Coconut Grove, Miami for USD $38 per vehicle per night for the duration of the tour; guests arriving into Fort Lauderdale Airport or the Miami Train Station will be responsible for their own transfer to the hotel. 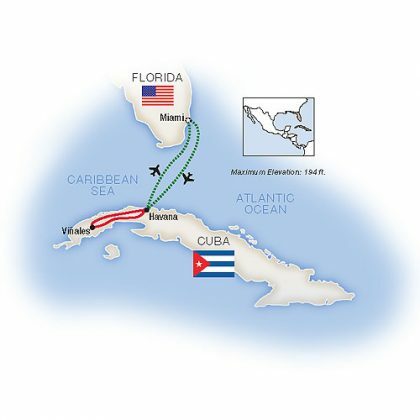 Your small group of 20 to 30 travellers gathers this afternoon at The Ritz-Carlton Coconut Grove, Miami for a welcome reception and Tauck Director briefing about tomorrow morning’s included flight to Havana and the start of your educational exchange trip to Cuba; dinner is included this evening. After an early breakfast, your Cuba travel begins as your group boards an included flight from Miami to Havana’s José Martí International Airport, where your local Cuban guide greets you. Drive from the airport to your home for the next five nights, the Meliá Habana in the city’s Miramar section, have lunch and check in; en route, stop at the iconic Plaza de la Revolución (Revolution Square), dominated by a memorial tower honoring 19th-century Cuban patriot José Martí. This afternoon, head to the Museum of the Revolution, housed in the neo-Classical building in Habana Vieja that had served as Cuba’s Presidential Palace from 1920 through 1959, for your first People-to-People cultural exchange in Cuba. Have dinner at the hotel tonight. Begin today’s People-to-People exchange at Habana Compás, a thriving Havana dance and cultural performance group; talk with company members about their mission, and watch a demonstration of music, dance or art. Then take a walking tour with a local historian through Havana’s Colón Cemetery, one of the largest in the world, and the final resting place of noted Cubanos from all walks of life. After lunch at a paladar, take a guided walking tour through Habana Vieja – the city’s nearly 500-year-old heart, now a pedestrian-only UNESCO World Heritage Site – with a local expert to discuss the city’s architecture and historic restoration efforts. See Havana’s beautiful Catedral de San Cristóbal, begun under the Jesuits in 1748 and completed by the Franciscans in 1777; learn about the cathedral’s ongoing preservation and restoration. Back at the hotel, attend a discussion on U.S. – Cuban relations; enjoy dinner at a Havana paladar this evening. Today’s People-to-People exchange in Havana begins a close-up look at a cultural passion shared by Cubans and Americans alike – the sport of baseball! After a morning discussion about baseball in Cuba with a highly regarded Cuban ballplayer at your hotel, head out to meet with the players, coaches and parents of a local Little League-level baseball team in Havana. Next, enjoy a cooking class focusing on Cuban cuisine, followed by lunch at a local paladar. This afternoon, you can relax at your hotel, or visit Havana’s bustling San Jose crafts market – the city’s main enclosed local arts and crafts market and cultural fair, housed in the restored and renovated historic San Jose warehouses, originally built in the 1880s – on the Avenida del Puerto. Enjoy dinner tonight at a Havana paladar, one of Cuba’s many private small restaurants converted from private homes, individually owned and operated under a license from the Cuban government. Managing Cuba’s land, water and other natural resources more effectively through agrarian reform, conservation, entrepreneurship and other initiatives is the focus of our People-to-People Cuba travel activities today. Travel outside Havana and across the countryside to the tobacco fields of the Viñales Valley, where you’ll talk to agricultural workers about agrarian life and tobacco production in today’s Cuba. After lunch at an organic farm, meet the workers who process tobacco leaves before they reach the cigar factory at El Despalillo. Return to Havana for dinner at your leisure this evening at the hotel. Depart Havana today for Finca Vigia (“Lookout Farm”) in San Francisco de Paula, American novelist Ernest Hemingway’s winter home from 1939 to 1960, shared with third wife Martha Gellhorn, and later with fourth wife Mary Welsh. See the author’s 9,000-volume library, his beloved yacht, Pilar, and his typewriter; talk with a docent about his life here and his strong connections to Cuba and its people (who simply called him “Ernesto”). Return to Havana for lunch at a paladar, then engage in a cultural exchange with students and staff at Havana’s La Casa del Niño y la Niña (House of the Boy & Girl), a UNICEF-supported, community-sponsored educational outreach program for elementary-school age children in the Centro Habana neighborhood of Cayo Hueso. Join us this evening for a farewell reception and dinner in Havana. After breakfast, transfer from the Meliá Habana to Havana’s José Martí International Airport for your included return flight to Miami. Tauck’s Cuba travel program of educational exchange ends at Miami International Airport. Allow three hours for flight check-in. Please book flights from Miami to your final destination no earlier than 3:00 PM. Note: Due to the nature of People-to-People travel in Cuba, itinerary is subject to change; the order and individual components of the itinerary may change depending on the day of the week, but a full People-to-People itinerary will be preserved. Nestled between Biscayne Bay and downtown Miami, The Ritz-Carlton Coconut Grove, Miami provides a chic, urban escape minutes from the vibrant city yet steps from charming, café-lined streets and hidden-gem boutiques. Miami’s Coconut Grove district serves up the city’s cultural soul. with art galleries, museums, boutiques and restaurants beckoning visitors to this historic Florida neighborhood. In the middle of it all, The Ritz-Carlton Coconut Grove, Miami enchants every guest with a truly unique hospitality experience. Inspired by the peacock hues of blue, violet and green, the hotel exquisitely blends in to the lush surroundings of this Biscayne Bay artist enclave. Luxurious guest rooms – each with a private balcony and floor-to-ceiling windows – feature goose down and non-allergenic foam pillows; luxurious, 100% Frette linens; a sumptuous marble bath with separate shower; European bath amenities, lighted makeup mirror, hair dryer, scale, plush terry bathrobes and towels; in-room, laptop-compatible safe; iPod docking station; iron and full-size ironing board; LCD flat screen television; and complimentary coffee and tea selection. Enjoy dining that exemplifies Miami’s diverse mix of cultural flavors. Find inner tranquility with a customized spa experience. Or let the glow of a fire pit and the comfort of an oversized couch make an evening on our Courtyard Fountain Terrace all the more memorable. An impressive lobby decorated with tropical flora welcomes you to the Meliá Habana in the heart of Miramar, Havana’s bustling new business center. Guest rooms welcome with a private balcony, satellite TV with 40 channels, hair dryer and air conditioning. After a busy day, cool off in the outdoor swimming pool – Havana’s largest – with its swim-up bar, or work out the kinks in the gym. Dining choices range from oriental fusion cuisine at La Bella Cubana to La Scala’s Italian menu, The Sports Bar, or the Miramar buffet, where dining is enlivened by traditional Cuban music – or, stop in at Bosque de La Habana for a wide variety of sandwiches, something from the Salad Bar and fresh juices. Watch the cigar roller at the Robaina Cigar Bar and perhaps enjoy one accompanied by Cuban coffee or rum… or choose Quinta Avenida in the lobby for an aperitif or a nightcap accompanied by live piano music. Tauck has been a leader in global guided travel since 1925. Family-owned-and-operated, Tauck offers over 100 inspiring land journeys, river cruises, small ship cruises, family travel adventures, and exclusive events across all seven continents – and has won over 50 awards for quality, innovation and leadership, including being named to many “World’s Best Tour Operator” lists.